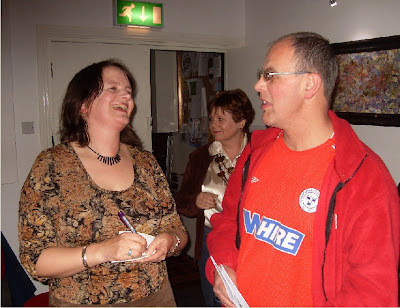 Last year or maybe the year before I attended a poetry workshop conducted by Dave Lordan at the Dromineer Festival. I really enjoyed it. Dave is a well known poet with a particular style of writing and delivery. 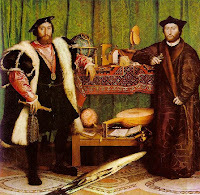 Sometimes people get the idea that if a poet has a particular style he/she will teach the style in a workshop. not true in my experience and certainly not true about Dave. I mention this because Dave Lordan is giving a workshop entitled Finding Inspiration in the Hotspot Cafe, Greystones on this Friday December 2nd. 7.30 to 9pm. One could do worse than attend. Where do stories and creative ideas come from? How can we make creative use of our own vast store of stories and experiences? How can we jump-start our imaginations when we just aren't feeling up to it? How do we draw inspiration from our every day lives? How do we make time in our busy lives for inspiration and creativity? The cost will be 10 euro, including admission to the fabulous Speakeasy Cabaret later on that evening. Booking is advised. To book a place phone dave on 0870921117, or e-mail at dlordan@hotmail.com. Read more about Dave at his website. Actress and writer Pauline McLynn is encouraging burgeoning authors to get writing and enter A. Vogel's national short story writing competition, which will run over the next five months. It is aimed at encouraging the creative people of Ireland to write the perfect bedtime story to help you on your way to the Land of Nod. "The written word holds so much therapeutic power, whether you are writing the words or reading them. I think we have all experienced the simple luxury of settling into a good story after a long day, and the ability of words to transport the reader to a different place or state of mind never ceases to amaze me, it is part of the reason that I love my job as a writer so much. I think the challenge of asking people to write a story specifically for bedtime is a really nice creative one, so I am encouraging everybody out there who has a story to tell, to download or pick up an entry form and get writing! I look forward to a winter cosying up with some of the great bedtime stories from the competition". The competition is free to enter, running from November 2011 to May 2012, and three prizes will be awarded (1st: €500, 2nd: €300, 3rd: €100) chosen by Pauline McLynn and Nadine O'Regan (Sunday Business Post Books and Arts Editor). You can also check out our top five stories on our Facebook page (www.facebook.com/AVogelROI) every month and vote for your favourite. Entry forms can be downloaded from the website. I mentioned the Western Australian poet John Kinsella in a blog from Perth. The Guardian yesterday published a poem of his, The Ambassadors. This is a wonderfully complex take on an Australian in London, standing before the famous painting by Holbein of the same name in the National Gallery, London imagining himself as an Australian ambassador. The poem is dedicated to the late Australian-born poet Peter Porter. Obit here, poems here. Things are moving fast as regards my history book for Four Courts Press. I submitted a draft manuscript before going to Australia. One of my editors has read it and returned it with an amount of praise and a small number of suggestions as regards improvements. He has also made quite a number of corrections, imposition of the publisher's house style etc and has cut about 1,500 words. This is great! I'm now doing the final (well probably penultimate) editing, adopting the editor's changes, dealing with his suggestions and cutting where I can. Maps are being prepared and the image for the cover has been chosen. Pictures to include are being finalised (sorry, Four Courts Press house style insists on z -) finalized. We expect the process to be completed by March 2012 and the book to be published as planned in winter 2012. My volume on Sligo will be the first in this important series and I'll be thrilled to see it published! Word count at the moment: 71,104. Target: 70,000. A great launch last evening in the cosy, comfortable Contemporary Arts Centre in Maynooth. A good audience, old and young, members of Maynooth writers group, some NUI Maynooth students, friends and relations, a couple of Poetry Divas, a man with a guitar who could sing, at least three bloggers, one Shelbourne supporter and the lady herself Kate Dempsey. She read six poems from her collection and gave her usual polished performance as one might expect from a diva. She even got audience participation - she had us blowing bubbles as her read her great poem, What To Do With My Ashes - (Use your imagination!). Kate's dinky book Some Poems can be bought online here. Above: Kate Dempsey and Peter Goulding sharing a joke. This evening sees the launch in Maynooth of Kate Dempsey’s book of poetry Some Poems one of the new series of dinky poetry books published by The Moth. The Moth Editions are small, really small (10cm high and 32 pages long). They will get lost on a bookshelf but are perfect for your handbag. Handbag? OK also for your inside pocket or briefcase or wallet or even to keep beside your computer. 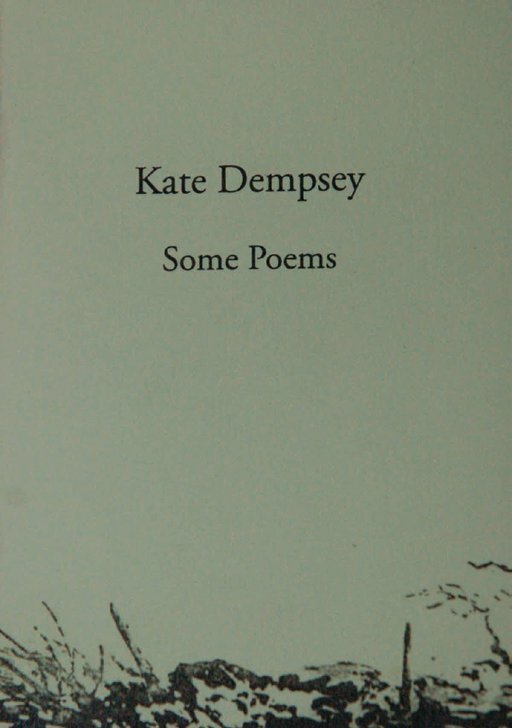 The book has 32 pages and includes many of Kate's greatest hits including the poem which won the Plough Prize this year, Amsterdam Otto Recommends, and While it Lasted, Lump and Verbatim. Kate read twice at our Boyne Readings over the last two years. The aim of the series is to present new work by up-and-coming writers and selected work by already established writers ‒ from Ireland and abroad. The first four titles in the series are Some Poems by Dermot Healy, Ciarán O’Rourke, Kate Dempsey and Ted McCarthy. The series is edited by the editor of The Moth magazine, Rebecca O’Connor, whose collection Poems was published by the Wordsworth Trust. Her poems have appeared in The Guardian, The Spectator, The Stinging Fly, Poetry Ireland Review and Poetry Review. The books cost just €4 each and you can also order them from the website (postage is free). The launch of Kate's book takes place tonight, Wednesday 23rd November 2011 from 7:30pm at Maynooth Contemporary Arts Centre, Coates Lane, Maynooth, Co Kildare, (off the Main Street between Supermacs & the TSB). 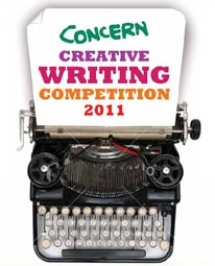 The 2011 Concern Creative Writing Competition book will be launched tomorrow, Wednesday 23 November, at 6.30pm in Newman House, St Stephen's Green, Dublin. The book is made up of winning and selected articles from 116 of this year's entrants. We in Boyne Writers are delighted that one of our members, Caroline Finn, has a piece included in the book. There were 776 entries from 39 countries spanning five continents and the standard was reported as being very high. The judges, top journalists from Ireland and the US, had an extremely difficult task in deciding the winners. The three winners in the adult section came from Australia, Canada and the Virgin Islands. The book can be purchased from the Concern website. OK, holidays over, back to normal. What about entering some competitions, this one seems interesting. Doire Press has just announced its 2012 1st Annual International Poetry and Fiction Chapbook Competition. Winners will each receive 75 copies of their own professionally edited and printed chapbook, published by Doire Press. Chapbooks will be perfect-bound, contain up to 40 pages, feature colour front and back covers, as well as their own isbn and barcode. Fiction: Alan McMonagle, author of Liar, Liar. He was second prize winner of the 2006 Séan O’Faoláin short story contest and one of four Irish writers long-listed for the 2009 Frank O’Connor Award. 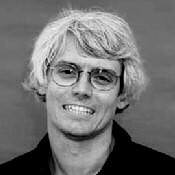 Poetry: James Martyn, author of Shedding Skin. He was short-listed for a Hennessy Award in 2006 and for the Francis McManus award in 2007 and 2008. €10 for first entry, €8 for each additional entry. Cheques or money orders to be made payable to Doire Press. Entry fees can also be paid via Paypal through the Doire Press website. Email submissions will also be accepted with an additional €1 printing fee per entry. Send entries via postal mail to: Doire Press, Aille, Inverin, County Galway, Ireland. Entries must include cover page with full contact information and title of story or first poem. Entrant’s name must not appear anywhere on the manuscript. Chava Kuchar, the hazard, Sculpture by the Sea, Bondi 2011. Arrived back in this country this afternoon after a month down under. The final three days of the holiday were spent in Sydney being shown around by cousin Gerald. The Opera House, the Harbour Bridge, the ferry to Manly, The Art Gallery were all very impressive. The weather was very hot for the first two days and we did the cliff walk from Bondi Beach to Bronte Beach (not named after the writers sadly) which was spectacular. 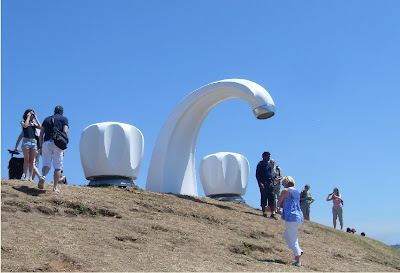 This has been made even more interesting by the Sculpture by the Sea exhibition which I think is an annual event. The dramatic site allows sculpture to display their work to the best effect and many of 100 or so work are stunning. Photos of all on the website. Picture above Simon McGrath's who left the tap running? a comment on a country where weather forecasts on TV often include statistics on the amount of water in reservoirs but also relevant to us all. 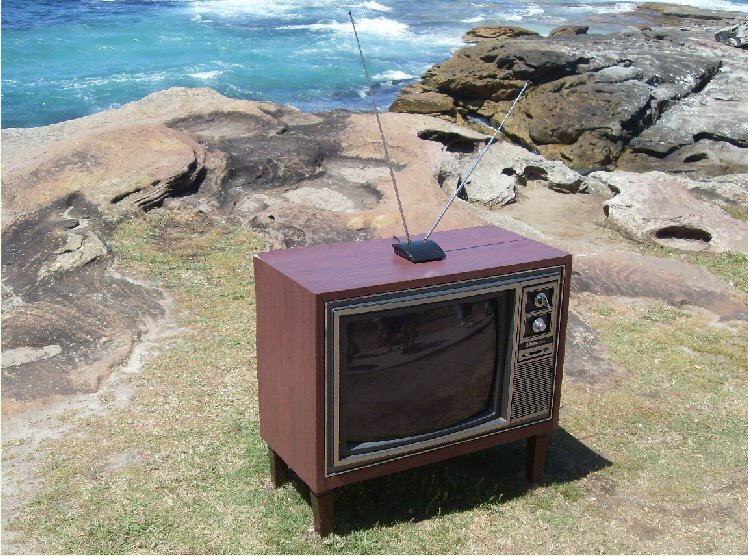 Below a sculpture - a TV set with rabbit's ears actually - entitled The Best of Perth by the collective of artists who studied together in Perth called k.m.s.e. We wondered about the "meaning" of this work, a dig at the quality of life in WA perhaps. I was also delighted to meet other relations in the Sydney area and to visit the resting place of my recently deceased aunt who sailed to Australia with husband and children in 1956. Thanks to all who made the Sydney visit so memorable. Then home by Etihad Airlines. A fourteen hour flight from Sydney to Abu Dhabi and an eight hour flight from there to Dublin where it has been autumn and is now winter. Much cooler and wetter (though Sydney had rain yesterday evening) but in a day or two we won't notice the difference. And so goodbye to Perth. We had a wonderful month there, saw most of the sights. And what a beautiful place, one of the most isolated cities in the world. Thanks to Sinead, Rav and Valerie and all the others who made the holiday so memorable. Thanks to the poetry people at Perth Poetry Club and Voicebox and the poetry classs at Fremantle. Thanks to those who made the visit to the WACA so enjoyable. We attended the A League soccer match last night between Perth Glory and Sydney FC. A slow start brought to life at the end of the first half by a Sydney goal against the run of play. This resulted in a great second half with Glory completely on top but failing to score. Match report here. Ex-Sligo Rovers player Adam Hughes had a good game and had a shot come back off the crossbar. Irishman Liam Miller also played well and had an effort just miss. At the end the Perth goalkeerer nearly scored from a corner. Perth are third in the table, Sydney second. A small number of away fans, about 50, made quite a lot of noise. Football chants seem to be more or less the same the world over though I haven't heard the version of the Ode to Joy before. Considering it's a five hour plane journey from Sydney to Perth it's a suprise that any away fans attended. All Perth's away games involve similar plane journeys since they are the only team on the west coast. The league includes one New Zealand team as well. Packing today, flying to the east coast tomorrow for a short visit then home after a wonderful holiday. There has been a running joke here about my inability to orientate myself in Perth - I'm blaming it on the change in hemispheres (A poem there perhaps) but this morning I managed to catch a bus from Melville to Fremantle and walk to the Fremantle Arts Centre. Fremantle Arts Centre (FAC) had been going strong for 36 years. The historic site was originally the first purpose-built ‘lunatic’ asylum in WA and is a wonderfully spacious collection of buildings with great grassy spaces. Out of the Asylum Writers Group Inc. is an independent organization that provides creative writing opportunities for new and emerging writers. The group meets socially & for writing classes every Friday in the leafy grounds of the Fremantle Arts Centre and are also involved in the Voicebox readings. I had been told at the Voicebox readings of a Friday morning poetry class conducted by poet Shane McCauley and with nothing else on the schedule I decided to attend. It was very worthwhile with about sixteen participants in a well organised, friendly session. We were asked to do three exercises, each of which was well introduced and had a "sample" poem. It being the 11th of November, the first topic was rememberance and war. Being Irish, neutral in WW2, meant that I felt a little outside the group, almost neutral in fact. After reading the great In Flanders Fields by John McCrea, Shane distributed copies of a war poem by e e cummings, the bigness of cannon to help us focus on the exercise. My effort reflected Ireland's neutrality and included a reference to my Uncle Paddy, who had a distinguished career in the Irish army, and often told the story of being ordered to open fire on an allied aeroplane overflying Leitrim during WW2. Uncle Paddy sadly passed away since we arrived in Australia. I ended with a reference to Paddy serving with the UN in a post-colonial situation in the Congo, a reflection on the unfinished legacies of two world wars. Only a first draft but it might become a poem yet. After each exercise we were invited to read our efforts and it was clear that participants felt comfortable to read rough drafts. I read mine which was well received. A second exercise dealt with Wants and a third shorter one with the sense of touch. We finished with a short poem by Rumi - Who makes these changes. A most enjoyable and instructive session thanks to Shane and all the participants. What poetry to read while on holidays in Perth WA? Last Sunday I popped into a small second-hand bookshop in Margaret River, The Margaret River Book Exchange - force of habit - and came across and bought a volume of John Kinsella's poetry. John Kinsella was born in the Perth area and is among Australia's best known poets. I had read some of his work in the US magazine Poetry and was struck by his combination of strong ideas on conservation, nature, environment with a mixture of the traditional and modern as regards form and style. He describes himself thus: I consider myself a writer of the environment - an ethically and politically motivated writer who perceives each poem, each text I write, as part of a resistance against environmental damage. This volume, The Hunt (1998), is great, full of the Australian environment, wheatlands, outback, roos, utes, wandoo trees, emus. The narratives and titles like Death of a Farm Boy and Death of an Infant remind you of Robert Frost but others like The Machine of the Twentieth Century Rolls Through the High-Yielding Crop and Dematerialising the Poisoned Pastoral challenge in a way Frost never did. The text of all the poems in the collection is here. There are sound files of John Kinsella readings at PennSound here. He shares a blog here. Delighted to get a chance to attend and read at another poetry reading while in Australia, this time the November Voicebox, at Clancy's Fish Pub in Fremantle. A very comfortable venue, a large room at the back of the premises with a proper stage, lighting and sound. Plenty of room, a large crowd of up to 50 people and a welcome for the stranger. The food was good as well - the Monday special is Barramundi, chips and a drink for 20 dollars. The first half featured local writers Jennifer Kornberger and Cecily Scutt. Jennifer Kornberger is a poet, playwright and community artist. Her first book of poetry, I could be rain was published by Sunline Press in 2007. She read a number of longer poems and enthusiastically shared her fascination with the phenomenon of seeing and light which are the subject of her next collection. Cecily Scutt is a Perth fiction writer and poet. Her short fiction has appeared in magazines and anthologies including Dreaming Down Under (UK, US and Australia) which won a World Fantasy Award in 1998. In the last few years she has also been writing poetry and she read a number of short poems. She also read extracts from a novel she is currently working on which deals with the character of Captain Fitzroy who was the captain of the Beagle with Darwin. The second half was open mic. Ten to twelve read in this section, the limit was five minutes each, no-one went over the limit, all were poets and read two or three each. A good variety with two from Perth Poetry Club, the two MCs Janet Jackson and a poet whose name I forget, also reading. I wasn't the only European to read. A lady from Belgium read three poems in Flemish or Dutch and her daughter read translations in English. I read three poems, starting with my Perth poem for Sinead, then The Truth and ended with the Journey Home. The second one went down very well with everyone "getting" that last line - "I raised her well" -and reacting appropriately. I changed a few words in the last poem to have the Christmas clothes parcel come from Sydney instead of New York. A great night, thanks to the organisers, audience and readers. Yesterday was a day of sport. A one day cricket match at the WACA here in Perth. The Western Australia Warriors were beaten by the Queensland Bulls in the second last over. We had great seats in the members enclosure thanks to one of the famous sporting Marsh family. Geoff Marsh is an Australian cricket legend, just appointed as Sri Lanka national cricket coach, and his two sons are also making names for themselves. Shaun is on the Australian test team at present in South Africa and Mitchell has just returned from playing in the Australian one day team in South Africa. An all-rounder, he played for the Warriors yesterday, bowling above. He was out for one run but then took four wickets. Their sister Melissa is a prominent member of the West Coast Waves basketball team. The ground still has one of those wonderful old manual scoreboards. The game started just after 11 and finished after 6. For those of us brought up on games of 60 or 90 minute duration cricket is such a different experience, a long period of time made up of a large number of short intense face to face encounters. Then the FAI Cup Final which started at 11.30 pm local time and was over at 2.30 am. I watched it on RTE.ie. Another great win for Sligo Rovers with lots of drama and many talking points. Irish Times report here. The nice thing about it was the number of reasons Shelbourne supporters have for complaining and giving themselves that good, righteous feeling that they should have won: the sending off, the referee obviously being on Sligo's side - look at all the yellow cards he gave Shelbourne players! - the goalkeeper moving off the line, etc. etc. So Sligo Rovers win the cup and Shelbourne get all the sympathy - seems like a fair bargain and one we'll take anyday. This was their third cup appearance in a row and their second win in a row - what about three in a row next year. By the way for some reason I'm not able to make comments on Blogger while here, on this one or on others, but can read them of course so thanks to those who have commented. I spent a few hours yesterday morning wandering through central Fremantle, visiting the Maritime Museum - which includes a very good exhibit on the WA whaling industry - the markets, a secondhand bookshop and having coffee in the fresh air. It did rain a bit later. Fremantle is a popular tourist destination and there are 11 self guided tourist trails in the city. One of these is the The Fremantle Writers Walk, a series of five art installations along High Street that celebrate past and present local writers. The art installations have been designed and fabricated by Fremantle artist Bridget Norton. Each installation features one selected writer and incorporates a short passage of writing from their work. The artworks are in the form of 2.4m high markers or totems, with the writer’s name and selected text on the face of the totem. Glass light boxes within the totem also provide text and graphic images relevant to the selected writing. The shape of the installations mean they fit easily into the streetscape but it also makes it easy to miss them. The extracts from the writings are small and not easy to read. Still a nice idea. What about something like this for Trim - surely we could come up with five famous writers. So far the ‘walk’ incorporates only 5 writers and includes one Irishman, Meath-born John Boyle O'Reilly. He actually spent only a short period of time in Fremantle and Western Australia as a convict before he escaped in 1869 but he did write what is commonly regarded as the first Western Australian novel, Moondyne (1880) based on his experiences as a convict there. The other writers honoured in the walk are: Tim Winton, Joan London; Xavier Herbert and Kim Scott. 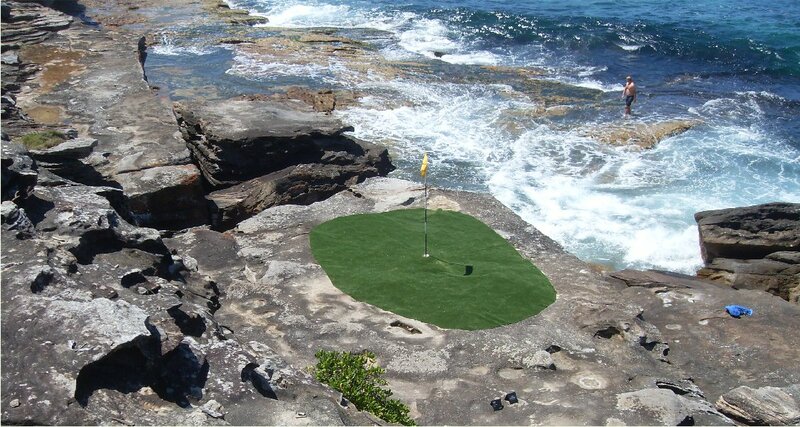 Sport is big news here in Australia and such a variety of sports. The Melbourne Cup horse race last week really did stop the nation and caused more news minutes than any sports event back home ever does. Swimmer Ian Thorp's comeback to the pool is also big news at the moment. The International Rules games was shown on TV here but was not the big news it might have been in Ireland. The Australian team contained few top ranking AFL players. The AFL is off season at the moment so I won't be able to attend a game. Tomorrow however I'm attending the WACA to see Western Australia play a one day cricket match and the following weekend I'm attending a Perth Glory soccer match. Glory are one of the top teams, Liam Miller is playing for them this season as is Adam Hughes who played for Sligo Rovers a few seasons back. Speaking of the bit o' red, their third consecutive cup final appearance is Sunday. I attended the last two, a loss and a victory, but this year I hope to watch it on RTE.ie by the magic of the internet. It's on at 10.30 local time here. Come on the Rovers! Freemantle Prison is a major tourist attraction being the only World Heritage listed building in Perth. It was closed as a prison in 1991 and remains more or less as it was then. It was built by convict labour between 1852 and 1859 from limestone quarried on site. By the time transportation ceased in 1868, just over 9,700 convicts had been transported to Western Australia. Our guide was a Dublin man and we were shown cells as they had been fitted out for the convicts and later prisoners. In the 1960s bunk beds were installed and two inmates had to share each cell - no air conditioning. Below the convict cell with hammock bed. We saw the kitchens and the church and ended with a visit to the room where the hangings took place. Meath born Fenian, editor, convict and writer, John Boyle O'Reilly, was transported in 1868 and imprisoned in Fremantle prison, escaped and organised the rescue of other fenians from Fremantle in 187 6 - the Catalpa rescue. The story is on the prison website here and here. When you think of Australian wildlife you don't immediately think of penguins but one species of penguin, the smallest, does live around the coast. This is the Little Penguin and a large colony lives on a small island just off the coast south of Perth - Penguin Island. It's a short five minute ferry journey to the island which is part of Shoalwater Islands Marine Park. During the day most of the penguins are at sea fishing but there is a small number on show in a Discovery Centre on the island. These are birds that have been injured, rescued and are unable to survive in the wild. I don't use the word cute very often but it certainly applies to these little creatures. The island is home to a variety of bird life and has large colonies of Australian pelicans (above) and enormous numbers of seagulls and terns (below). There are dolphins and sea lions around the coast though we saw none of these. The walk around the island on boardwalks is spectacular - a lot of flies though, I should have have bought one of those hats with corks! Oh yes, each evening and morning we had kookaburras outside our chalet in Margaret River. They are related to our kingfisher. Last weekend was CHOGM weekend in Perth with the Commonwealth meeting and the Queen's visit so Friday was a public holiday. We were taken south to the Margaret River area for the weekend. A glorious break - sunshine and golden beaches, wine and olive tastings, a chocolate factory and plenty of good food. Other highlights :Ngilgi Cave near Yallingup, picture above, Cape Naturaliste lighthouse, picture below. From the top of the lighthouse we saw whales in the bay, southern right whales the guide said. We visited Canal Rocks and Sugarloaf Rocks on the beautiful rugged coast in the Leeuwin-Naturaliste National Park in this south west corner of Australia. We saw more whales from the Canal Rocks! It's been a great holiday so far!! Now that CHOGM is over the news is the Quantas dispute with an Irishman, Alan Joyce, head of the airline and getting quite a bit of abuse for his actions - some praise as well. That and the Melbourne Cup, "the horse race which stops a nation", which is on today. Two Irish horses running I think.